Lancashire Gardens Trust promotes the conservation and enjoyment of its Historic Designed Landscapes, gardens, cemeteries, squares and promenades across the post 1974 County of Lancashire, and Merseyside and Greater Manchester north of the Mersey. On the National Heritage List for England there are 38 of these in post-1974 Lancashire; in Greater Manchester there are 29 and in Merseyside there are 23. These sites are notable for their history, architecture, archaeology, ecology and horticulture. There remain many more historic designed landscapes of interest and importance and we have undertaken to investigate these through research projects, recorded in Researching Parks and Gardens. An exciting piece of news in 2017 was the announcement that the Royal Horticultural Society has purchased the estate Worsley New Hall, Salford, where it is planned to create their fifth regional garden, following on from Wisley, Hyde Hall, Rosemoor and Harlow Carr. Its name is Bridgewater Garden and the newly-planted terraces reach down to the Bridgewater canal. 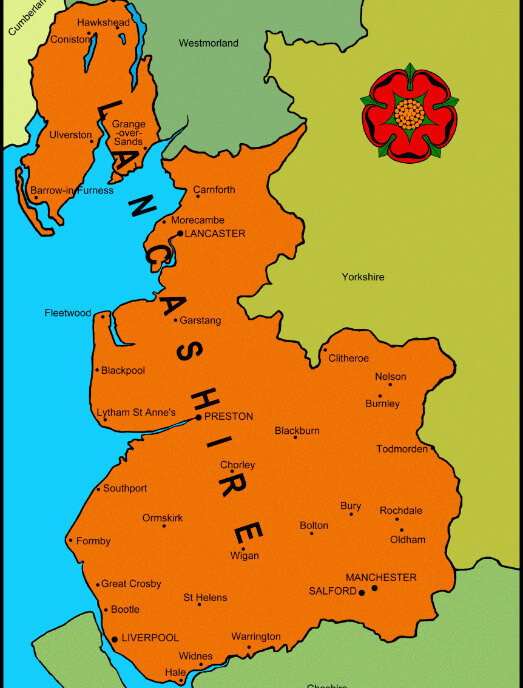 John of Gaunt, 2nd Duke of Lancaster, held land northwards to the Furness peninsula and southwards to the river Mersey; this was the historic county. In 1974 the Furness peninsula was taken into Cumbria, Greater Manchester was created with 10 boroughs and Merseyside was created with 6 boroughs. ‘New’ Lancashire now comprises 14 boroughs. When recording historic gardens we find that they may fall in any of these districts. The topography is very diverse. The Pennine chain of hills forms the eastern boundary, fertile river valleys lie to the north whilst in the west are reclaimed mossland and coastal dunes. The manufacturing towns in the south of the county, lying on deep coal seams, made an important contribution to Britain’s Industrial Revolution; the wealth thus created helped to build the many public parks for which the county is noted. Its war memorial parks are of especial range and quality, and formed the subject of our research project in 2017, War Memorial Parks and Gardens in Lancashire. English Heritage was formed in 1983 when the Register of Parks and Gardens of Special Historic Interest was also created with government backing. A historic designed landscape is placed on the Register when it is considered to be of national (or wider) importance and therefore worth protecting. Our researchers have mostly been new to garden history and have soon acquired a taste for the investigative work which brings such satisfaction when a rare document is discovered or when some detail of provenance is proven. Even the simple technique of comparing maps from different periods can reveal such startling truths. Our most recent project has been Lancashire’s War Memorial Parks and Gardens, published to coincide with Armistice Day, 2017. We were astonished that many of these Gardens of Remembrance and Memorial Parks had been overlooked during the visits conducted for the 2013 report. Research into these special places was conducted differently, consulting contemporary newspapers and council Minute books to obtain more personal details and attitudes towards suitable forms of remembrance. Although many means were proposed, (swimming baths and electric lighting even) the Garden of Remembrance was the most widely chosen form. A garden is symbolic and comforting. We work alongside our umbrella organisation, The Gardens Trust, which organises workshops and study days designed to train volunteers in these methods. Their Resource Hub is a valuable source of advice and information, being the lectures and instruction leaflets from these workshops. We meet at regional centres, for instance Lancaster, York and Birmingham, where we exchange ideas and methods. We welcome anyone interested in entering the fascinating world of garden research with us. This report is a key outcome of an ongoing project on Lancashire’s historic designed landscapes.